This file does not have a program associated with it - what does this mean and what do I do? - Ask Leo! This file does not have a program associated with it – what does this mean and what do I do? 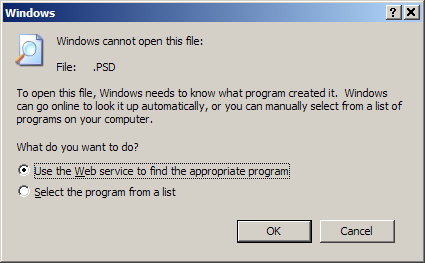 This file does not have a program associated with it is a common error message when Windows doesn't know what program is used to open a file. I'll look at what that means, and step you can take. A file can contain anything. Under Windows (and under MS-DOS before it), the convention was established that the characters following the last period in a file name, called the file “extension”, tells you what kind of data that file contains. “.EXE”, for example, is an EXEcutable program. “.JPG” is a jpeg compressed image file, “.TXT” is a plain text file, and so on. In addition to knowing what type of data a file contains, Windows also needs to know what program should be used to access that file. If that information is missing, then “This file does not have a program associated with it…” is one of the possible error messages. The reason? I apparently don’t have a program installed that understands what to do with a “.psd” file. As a result, I cannot open the file. The most common way to resolve this issue is simply to install a program that understands files of that type. In most cases, when a program is installed, it also sets up the associations for all the file types that it understands. In this case, if I were to install Adobe PhotoShop, which understands “.psd” files, then I should be able to open them without a problem. Attempting to open a “.psd” file would then start up PhotoShop, which in turn would read and display the file. The most common way to resolve this issue is simply to install a program that understands files of that type. Many applications allow you to control exactly what file extensions they are supposed to support in their options. Fire up the application that’s supposed to handle that file type, and search for its options dialog, or other settings. If you find the ability to associate the program with a particular file extension, this can resolve the problem. As I mentioned, many programs set up their associations when installed. If the program offers it, in Control Panel, Add/Remove programs, find the program that’s supposed to handle this file type, and perform a “repair” install. If “repair” doesn’t work, or isn’t available, then a full uninstall and re-install of the application may do it. Press OK a couple of times and things are reset. This doesn’t work for everything, but it’s an example of how many programs have the ability to reset their associations without needing to be reinstalled. OK, what if none of that works, or for some reason you want to do things the hard way … er, by hand? First, you need to know what program you want to use to open a particular file, and that program must already be installed on your machine. Note that I’ve already typed in “psd”. 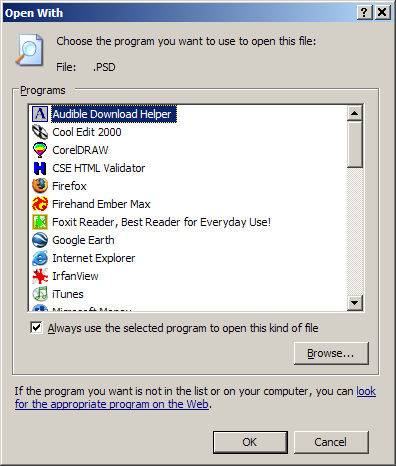 In my case I happen to know that a program I have installed, Firehand Ember, will also read my “psd” files, so I click on that, make sure that “Always use the selected program to open this kind of file” is checked, and press OK. Now when I try to open a “.psd” file, Firehand Ember will be launched and used to display the file. Obviously you’ll need to choose both the correct extension and program for the problem you’re attempting to solve. Quite often you’ll be faced with a file extension and have no clue as to what it is, or what program should be used to open it. There’s often no single answer, but a good resource to research the meaning of various file extensions is FileExt.com. There you can enter an extension and it will list all the possible meanings, including the most likely or most common use. Why do I say there’s often no single answers? Because there’s nothing to prevent two or more different and totally unrelated programs from using the same file extension for totally different things. A great example is the “.dat” file – I count well over 20 different possibilities, and there are probably many, many more. In case like this, you’ll need to know more about what program was used to create the file before you can make a choice on how to open it. Answering “How do you want to open this file?” - Deciding how you want to open a file depends on knowing what the file contains and knowing what program will understand that. One change you should make to Windows File Explorer right now to stay safer. - Windows Explorer tries to help by hiding some information. Unfortunately, that opens a hole that hackers can use to fool you. Why Do I Get an Error When Viewing JPG Files? - Your email should be able to open image files if your Windows Explorer can. Fortunately, I have a few possible solutions to this problem. « Previous post: Safely Remove Hardware: Where Did the Icon Go? How Do I Safely Remove Hardware Without It? Hi, unfortunately one of my 2 pcs had a trojan.downloader virus which has totally transformed all my ,exe extensions to .ini I think. I managed to get rid of the virus but now I cannot open any programs with a .exe extension. I cant even get into my windows xp cd to re- install. Can you help plz? Trying to open a pps type. Did all the steps above, reinstalled MS PowerPoint Viewer 2003; PPS is listed in “Folder Options”. Still cannot open email with PPS attachment. Get file does not, etc. Any other help? That’s all well and good (actually very helpful in general) but what to do if you don’t know the extension, as is the case with Error Reporting? The top of the error message window reads: “http://oca.microsoft.com/resdir.aspx?sid=……” and no amount of expanding or shrinking will give a usable extension. I think I managed to see what it was once (or at least what was at the end of that line) but there was nothing like it in the File Types box. Presumably there would be something else to do to fix what’s wrong when Error Reporting gives a “This file does not have a program associated with it” message, even though it goes on to say “Create an association in Folder Options Control Panel.” Can anybody tell me what’s wrong and/or how to fix it? I receive the same message, “This file does not have a program associated with it,” when I try to open ANY web site on IE. I’m running Windows 98 on AOL. The sites will open in the AOL browser but not IE. Please help. I don’t always want to use the AOL browser. I’m trying to open Xml file and it shows me this this_file_does_not_have_a_program_associated with it. But I have an assocition, which says, XML doc can be opened with XMLeditor. Can you tell me why I still see this error msg? I was able to fix my problem. You’re wonderful. Enjoy your latte. Followed step by step, still get the same results when I try to open .pps in outlook express. MS Powerpoint viewer installed and associated with pps. Any other suggestions? Can’t open attached xls, doc files (and some others) with msg “this file does not have an assoc…” under Windows Mail (Vista). Of course I have both Excel and Word. I have to SAVE them to be able to open. Any help? this excat same thing is what has happend to me but when ever I go to folder option everything is all good until I click on file types and then everything just goes away and everything I had running is gone what do I do? I am getting the same error message but only for .pdf and .jpg files. I have tried all of the above solutions plus the fixes from several web sites. I can drag the attachment to the desktop and it opens there just fine. Hi Leo, I am trying to help a friend, she cant open any program without going to run and typing it in. all her folder extension things dont work. any suggestions on a quick way to fix all of them? I Can’t right click it, and the file type doesn’t display. do you have the steps necessary for microsoft office 2007? ..so plz help me to come out of this situation.. I solved this problem by “repairing” Adobe reader. After installing the latest version of Adobe reader I could not open the pdf files and the error message “this file does not have a program associated with it to perform this action appeared everytime, even after I created the association. For some reason the file uploads with errors or missing components. Removing and reinstalling will not fix the problem. Do not run anything else while this is being done. Once it is done close the program & turn off your computer. turn it back on. The problem should be solved. PS: I can open some programs only if I have something from them(not abridgements). I mean that I can open word only if I have a saved file-text at word. Hi my problem is, when i click the control panel at window start menu, it give me tat problem. i get this message “this file does not have a program associated with it to perform action.create an extension in the folder option control panel” when i try open my drives c,d,e,f by double clicking on them.please give me a solution. Just wanted to say .. can’t believe I was able to fix things .. I got an email with attachments and I got ‘that’ message. I typed in search engine and got this website. I never read through everything. 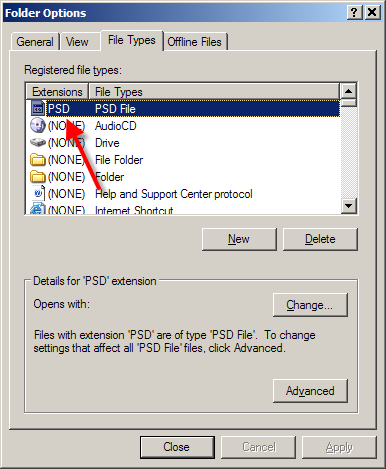 All I saw was “psd” so I created a new file ext. typed it in, clicked change, selected the program that I was instructed to download when I received the email with the attachments otherwise I wouldn’t have known (adobe acrobat 9) and presto! I can now open the attachments! So, thank you to Leo and his website and clear simple instruction. Finally it worked! The File Options method did nothing for me. Using Add/Remove Programs, Change, Repair Install, woorked. Now I can view my pdf attachments in Outlook Express. This doesn’t work at all(I’m not making a new file type, all of the sudden my bitmap,photoshop,gif,png,and jpeg files won’t open in their programs like they did and i have to go through the program to open them help. Hi I have this problem when I try to open my drives by double clicking on the icons in “my computer” but when I right click on them and select explore, they open!!!!! so what kind of association I need to create???? i am facing this problem when i am trying to open inter explorer don know wat to do ?? I get the no association message when opening a file from an email in MS live mail. the files have an association, I redid it, unistalled the programs EG: VLC and WMP, same problem, the file open if I save them. please help!!!! !I get this message “this file does not have a program associated with it to perform action.create an extension in the folder option control panel” when i try open my drives c,d by double clicking on them.please give me a solution. Certain file extensions won’t open app. “no program associated” error. In particular HTML is set to ope with Firefox yet double clicking .html files gives the association error. When reset to default it will open with IE. I can edit it in the control panel to open with Firefox, however then I go back to the same error. The icon is changed to the firefox icon but FFox won’t open. My solution: Right click on email attachment; click on “save as”…; then locate in documents; double-click on icon and it opens! my windows cant open any file………of any extention….exe .reg any file!!! it just says tht windows doesnt know which software created it! !please help!! may i open all program. when i try to open file exe on windows xp. the program alway ask me “This file does not have a program associated with it is a common error message when Windows doesn’t know what program is used to open a file.” how can i open all file on my computer. Please help me! Thank you. I deleted Mozilla firefox and want to reinstall, but get this message. I don’t know how to fix this problem in the control panel, folders option??? I have this error popping up every time I start my computer. I downloaded an excel spreadsheet pulled some information off of it then deleted it. Is there a way I can make this pop up stop coming up? WHEN I GO TO THE COMMAND THAT SAYS “OPEN WITH..” IN ANY FILE, I GET THIS TEXT “There is no program associated with this file to perform the action. THE PROBLEM IS THAT 2 DAYS AGO THE COMMAND WORKS PERFECTLY .I TRIED TO DO RESTORE SYSTEM AND THE PROBLEM REMAINS.I HAVE DONE ALL THE STEPS THAT WIN TOLD ME ..CONTROL PANEL….. Even after following all the above, still I’m unable to get over this problem! I had Vista removed and had Windows 7 Professional Edition installed. I see from your screen shots that you likely were using XP. Windows 7 FOLDERS OPTIONS does not have a FILE TYPE Tab or any way there, to CREATE A NEW EXTENSION. I looked for .torrent in my ASSOCIATED FILE LIST and it is not listed, which probably explains why I get the error message about ‘unknown file type’….’find program online to open’. Going online gets me nowhere, can you advise on what can be done in Windows 7 to ADD an extension to my list. I also have no idea what program my computer would have that recognizes them…when you go to the site, it just normally works?? I appreciate your help and ideas. Please, please help me. I am getting that msg, about program doesn’t have a file association…but it is with my PDF files. I didn’t used to have this issue, but Dell told me I had a virus (said it wasn’t a bad one) but still. Now my PDF’s won’t open. I tried to go into control panel-default programs-assoc a file type or protocol with a program and clicked on the Adobe files, but still I can’t open it. It appears a lot of my files current default is unknown. Can I fix this? Or do I have to uninstall everything and reinstall all my driver, etc? This is what Dell told me I would have to do. Or pay $130 to have them fix it. I don’t know what to do! Oh I guess I should let you know I am on Vista. Thanks again. when i try to open ANY program on my computer i get the following message: his file does not have a program associated with it for performing this action. create an association in the set associations control panel. I’m with Carlos’ April 5th comment about ANY application. Most of the comments have been about how to associate new apps through File Options. Pretty simple. But why does this same message display, at random, for extensions that have already been on my system for years? For me it is happening when I open an application not necessarily an actual file. Although I have received many of these errors showing different files names, one example is “Docements..ErinLocal..TempHSS2B.exe”. I know this file is associated with games, but I don’t know why it would screw everything else up. why would .exe not have an association, or is it something else that has to do with the HSS2B app? Any thoughts would be MUCH appreciated. windows 7 installed ok yesterday. today i tried to get skype and skypemate organized and then all the programs ended up with skype logo. tried to undo..finally reinstalled windows 7 but didn’t fix and now most programs have an arrow and”this file does not have an asociation..etc” HELP! when I get a picture (jpeg) from an iphone, it gives me the error message, above. when I send from my iphone, it comes in and outlook express opens it. how do I fix? I also have the same problem on one of my laptops running vista. I can manage to get a few programs to open (such as firefox) by right-clicking and running as administrator but i still need to fix the problem. sick of getting “This file does not have a program associated with it for performing this action. Create an association in the Set Associations control panel” from everything i click on! if anyone finds a solution please post here or even better, Leo post an answer and guide for this problem that seems to stump a lot of people. dude i got a problem i guess similar but in this case i cant open exe or lnk files in my computer do you know what can i do? Right out of the blue, so it seems, I’ve got a similar problem and haven’t seen a fix yet that works. I get this error message for almost everything…My Documents, My pictures, all of the shortcuts on my Desktop, etc. I’ve tried numerous suggested “fixes” but none of them has worked. I hate to say it but I upgraded to IE 8 just before this problem first arose. I hate to think that’s what caused it, but maybe…. I am suddenly getting the “This file does not have a program associated with it …” error message when I try to open a common folder. This is true for any folder on any drive (fixed or removable). I can open the folder by right clicking/selecting “open”, but the usual double-clicking the folder method no longer works. Any ideas? I too am having the same identical problem as Matt (posted comment on January 13, 2011 5:23 PM) I am suddenly getting the “This file does not have a program associated with it …” error message when I try to open a common folder. This is true for any folder on any drive (fixed or removable). I can open the folder by right clicking/selecting “open”, but the usual double-clicking the folder method no longer works. Interestingly enough this problem started after Windows did an update on my computer today. How do I fix this? Any help is most appreciated. I had same problem same Matt Kristen and Alex. Cheers for your sujestions followed your instructions and it is all sorted no further problems. Goto Folder Options, select the File Types tab. I’m getting message that this program does not have a program…I have read the article several times with the hope that I missed something. As it stands, I cannot carry out any of the suggestions since I get the same message when trying to download fix it programs. When I open my Control Panel, and click on the folder option icon, it will not open, so how do I create a program associated with it, if it will not open? I need to open an attachment that came with an email that was sent to me, and it gives me this reason why it will not open. 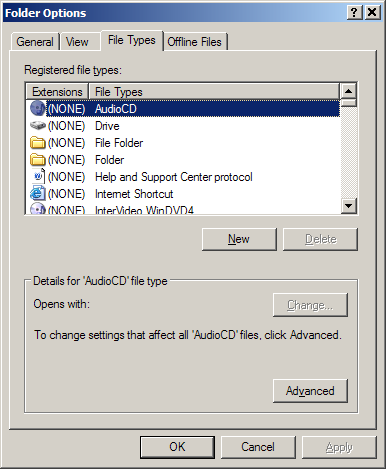 Everytime I tried to play a CD, DVD or even inserted a USB these message keeps appearing “windows media player cannot play the file because the required video codec is not installed”. Video codecs are files that decode the video. VLC is a small free video/audio player which has most of the codecs you need built in. Somebody send an email with a web link included. I click on the “blue” text and instead of going to the website, I get the “THis file does not have a program associated with it”. I go to Control Panel, Default Programs, and I don’t know which programs goes with what. HELP! I HAVE WINDOWS 10 I WAS TRYING TO DOWNLOAD A CURSOR AND IT SAID THIS FILE DOES NOT HAVE A PROGRAM ASSOCIATED WITH IT FOR PERFORMING THIS ACTION. CREATE AN ASSOCIATION IN THE DEFAULT PROGRAM CONTROL PANEL. I AM NEW TO THIS WINDOWS 10 ITS BEEN YRS SINCE I HAVE OWNED MY OWN COMPUTER. SO IM KIND OF IN THE DARK WITH ALL THIS I DONT KNOW WHERE TO GO OR WHAT TO DOWNLOAD.